Here we go, I am used to logging food on MFP or LoseIt but I don't want to get hung up on the calories, so I'm logging here. I'm fat-wary for 2 reasons, one as a lifelong dieter, plus as someone who gets heartburn from fat. I'm hoping the eating style will deal with the heartburn in time, so I'm looking to incrementally increase it. It doesn't help that I'm not really a fat fan- yes on meats, but I'm not real big on oily dressing or sauces, and I hate avocado. I like nuts but they don't really fit my meals. Something to work on. Lunches will be the same all week, as I batch cook. Dinner will get more adventurous... though it's so hot here now that grilled meat and veg is a joy. Day One achieved! Had herbal tea after dinner, feeling good! Day 2 achieved, despite hurdles! Ended up having to go to a bar with a client (long story, it was the only place around while we waited for another client), and after struggling with myself and almost thinking 'stuff it, I'm only on day 2 and I can start again", I ordered a soda water and made my compliant dinner when I got home at 9. All food to plan as above, save that I didn't have the broccolini. Dinner: I have no idea!! I've been so busy all day, but I have a well-stocked freezer, so I'm sure I can throw something together. Maybe orange and mustard marinated pork steaks with lemon broccolini and toasted almonds, smashed garlic and rosemary potatoes and some wilted spinach. Well, work blew up again, so I didn't get dinner until 9:45, It was grilled pork chops, arugula, baby beetroot and almond salad with olive oil and balsamic, and broccolini fried in the pork fat. Dinner: Pan-fried fish with lemon and capers and a shaved fennel, apple and arugula salad with lemon tahini dressing and seasoned sweet potato wedges. Buying a bunch of fresh limes tomorrow. I'm day 4, so I'll probably just add another 4 on the end. Otherwise, another late night at work meant I couldn't get to the store so we had porterhouse steak with grilled broccolini, sweet potato and carrot, and an arugula, cucmber and baby beet salad with balsamic and oil. So the weekend hasn't been any trouble so far, save for a long while between meals today. Dinner was pan fried fish with cracked pepper and lemon zest, home made fries with my own blend of seasoned salt and a shaved fennel, radish and arugula salad with lemon tahini dressing. We went to an exhibition today with friends and we're there for most of the afternoon. The limited cafeteria had absolutely nothing that was compliant, save for a fruit salad (which I don't eat), so I just had a black coffee and waited til I got home. I wasn't ravenous though, and dinner was lovely. I bought a bunch of lemons and limes and have zested them (keeping the zest in jars in the freezer!) and juiced them so I'm right back on my soda water with lime juice. Tomorrow is food prep day - we're having slow roasted lamb shoulder for dinner tomorrow, so I'll roast a bunch of vegetables and have those with leftover lamb for lunches for the week. Day 6! I'm surprised how not-hard this weekend is, thus far. Breakfast/brunch is Mexican stuffed omelettes. Spicy beef mince, eggplant, mushroom, capsicum and tomato in fluffy omelettes. Dinner is going to be slow roasted lamb shoulder with rosemary and garlic smashed potatoes, broccolini, roasted carrots and wilted cabbage. Not sure on lunch, yet! I also made roast chicken and veggies for the hubster for his lunches, and some Cheddar Bay biscuits for his breakfasts. Those are the first real temptation I've had, I LOVE those things. But aside from a momentary hankering, it was all good. I did go back for another serve of lamb because I was still hungry after dinner, but I'm still well on track. I made it through the weekend!! And actually quite easily! Hubster had beers, but I was perfectly find not having one and just enjoyed my soda water and lime juice (fresh squeezed and compliant, now!) Had a "duh" moment when I was packing his lunch and put his seasoned chicken in a container then licked a finger - non-compliant seasoned salt! But I realised and rinsed and spat lol. Hey @SchrodingersCat I got my salmon curing also! Sorry to hear about your lime juice incident but it sounds like you handled it well. Congratulations for doing so well! It's hard to break the habit of licking the spoon, fingers, etc! I've made things that I couldn't taste and just enlist my husband (since it's something I'm making for him or his work anyway) as the official taste-tester. Your lamb sounds so good. I love lamb but my husband is not such a fan so every now and then I roast a leg of lamb- just for meeee! The juice was disappointing, but I'm so glad I caught it early. That sticky list of E numbers to avoid in "Can I have..." is a godsend. Dinner: Chicken Teriyaki stirfry using Niulife Cocomino Teriyaki sauce with capsicum, cabbage, carrot, broccoli and mushrooms. I'm looking forward to trying this sauce, if it's as good as it smells, I'll get the BBQ and the Sweet Chilli versions too! My eating schedule is screwy, I need to shift it back. I've somehow ended up eating meal 1 around 11:30am, meal 2 around 4pm, so dinner is around 7:30-8pm which is find, but too close to meal 2. I just don't get hungry in the mornings, and will feel ill if I force the issue. In other news - Cocoamino Teryiaki stirfry tonight! Really hoping it's as good as it sounds! Niulife Cocomino Teriyaki sauce is a bit bland. Not terrible or objectionable at all, just needed some sprucing up with a squeeze of lemon juice and chilli. That's a gorgeous plate @SchrodingersCat! I love dukkah and happen to be out of it so thanks for the reminder. I've made nomnompaleo's stir fry sauce and really like it: https://nomnompaleo.com/2017/12/24/purpose-stir-fry-sauce . I usually make enough to freeze because I don't usually have oranges to make it. Wow you seem like quite a cook! That's amazing! My dinners tend to be a protein thrown in a cast iron skillet, baked, sauteed, or steamed veggies, and maybe some avocado. I'm going to have to up my game! I'm all for simple but interesting! All you need to jazz up your veggies is some interesting spice mixes or dukkah (there are heaps of compliant ones out there in a variety of flavours) and I just figure that cutting up some uncommon and interesting veg and salad is just as easy as cutting up the staple ones! 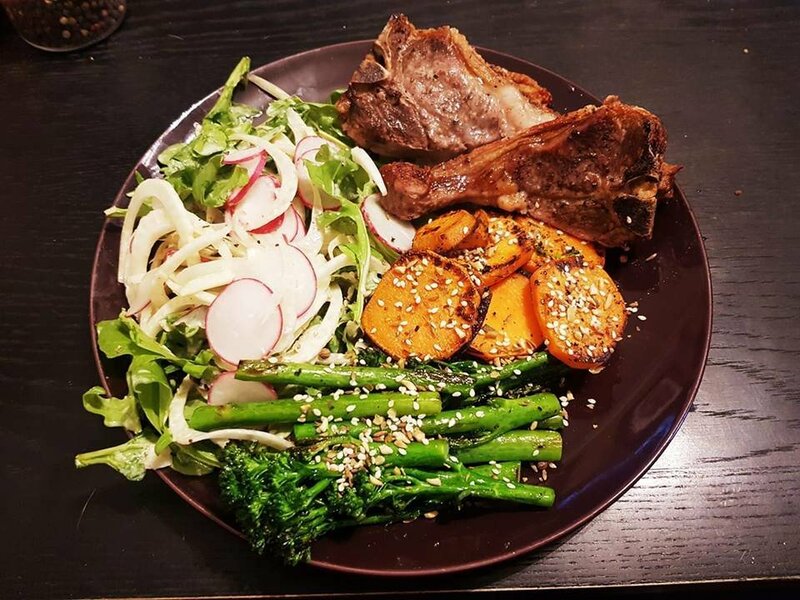 Our dinners pretty much always follow the protein + starch + veg model, the hubster is a lot plainer eater than I am so he will get sides like mash, or oven fries or baked potato with carrots and peas or a green salad, while I do my own thing for sides. So blergh - I've woken up with my digestive system trying to will itself into non-existence. I also ache from the full body workout I did day before yesterday - I always get so much more sore the day after the day after, for some reason! I'm sleeping so well at the moment, but the alarm is a harsh mistress. I know from the weekends that I'd probably wake up naturally within an hour of it going off, but I'm never quite ready when it does. I have the exercise physiologist tonight, so I'm hoping I feel a bit better by then! Good day today, I have a new home routine from my exercise physiologist and he's happy with my progress! Dinner was almost as planned, save I didn't have sweet potato, I had almonds on my salad instead of pine nuts and lemon tahini dressing instead of balsamic. I'm sleeping so so so well. Falling asleep very fast, and even though the alarm is painful, once I'm awake, I'm actually awake. I'm not getting mid-afternoon sleepies either. I'm not struggling with food. I'm being inventive, trying new things. I am spending WAY too much time thinking about food though, but that's pretty much par for the course for me, when I have a new challenge. I'm stunned that I'm not struggling with alcohol - not because I have a dependency or anything, but I am a social drinker and the hubster hasn't given up weekend beers and I thought it would be more of a struggle to not join him. My digestive system and IBS symptoms haven't settled as much as I'd hoped but they have definitely improved, and its only 10 days in. Months of irritation won't be cured in 10 days. I think my skin is better - The dry skin around my face seems to have cleared up, and it's a lot softer. I think I've lost weight - no weighing or measuring but the non-stretch shirt I wore yesterday fit better than it did 2 weeks ago. So all in all, I seem to be travelling pretty well. Dinner: White fish with native lemon pepper seasoning, grilled broccolini with pistachio dukkah, salad of some description. Missed breakfast, too bleedin' hot to eat here today! Fish and salad is a very good choice for dinner, the less cooking time the better.